Little Rocky Road Studio is a luxury studio apartment located in the gum trees and surrounded by wildlife. The decor is modern and functional with a warming gas fireplace and equipped kitchen. Out on the deck there is a BBQ and seating for alfresco dinning. The bathroom is stocked with oversized super soft towels plus designer soaps and conditioners. This is the perfect getaway for a romantic weekend or for longer to explore the unique Snowy Mountains. The resort has two restaurants onsite. 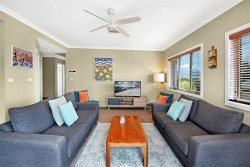 'Cuisine' boasts inspiring views of the Lake Crackenback waterfront and mountains beyond. It offers authentic flavour incorporating produce from the local region. Head chef is the world renowned Jean-Michel Gerst. The second restaurant ,Alpine Larder, is more casual dinning with wood fired pizza and pasta dishes. As our guest you have access to all the fantastic facilities at the Resort is a bonus - tennis, canoeing, paddle boarding, golf, indoor swimming pool, archery, and Segways and mountain bikes for hire. Unfortunately there is no WiFi but we can arrange an option [cost] of 22gb Telstra 4g Mobile Modem for your stay. Studio can be combined with the adjoining Chalet (in the same building) to give total accommodation for 6 guests. Click here to view description & book Chalet. No WiFi but you can order 22gb Telstra 4g Mobile Modem with your holiday. Peter was very quick to respond and everything was well prepared for arrival (even a lovely brochure pack of the area). Thanks for a great stay we really enjoyed both the apartment and the resort... great weather you put on too! Lovely place ideal for a couple, nice and clean with everything you could need. Just a little walk up the hill from the main resort area but lovely and quiet. Hi Peter, we really enjoyed our stay in this great studio.You were quick with responses to my questions. Thanks! Ed. We really enjoyed our stay in this great studio. Fantastic spot on the hill with beautiful views to the mountains. We were lucky to have perfect weather too. Ray White Jindabyne are very helpful and friendly. We will definitely come back to Lake Crackenback. What a gorgeous setting with views of snowcapped mountains from the deck. We had a welcoming party of kangaroos on the front lawn. Very peaceful and comfortable stay. Dangerously comfortable king sized bed! Thanks for the fantastic service with directions and tips.. Wonderful location for the mountains! Beautiful view! Very nice room! Thanks! !